Zhejiang, which Gu Yuese protested. (Hangzhou, Zhejiang—Jan. 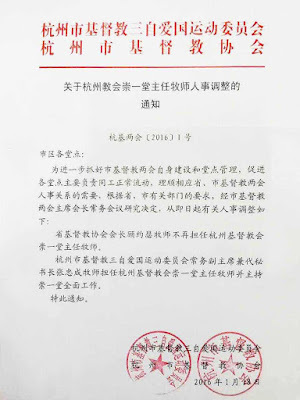 22, 2016) The local Three-Self Patriotic Movement (TSPM) and China Christian Council (CCC) in China’s coastal Zhejiang province released a notice detailing the forced removal of a pastor from his position at China’s largest government-approved church on Jan. 18. However, Gu’s public opposal of the forced demolition of church crosses raised suspicion among many concerning a correlation between his advocacy and dismissal. 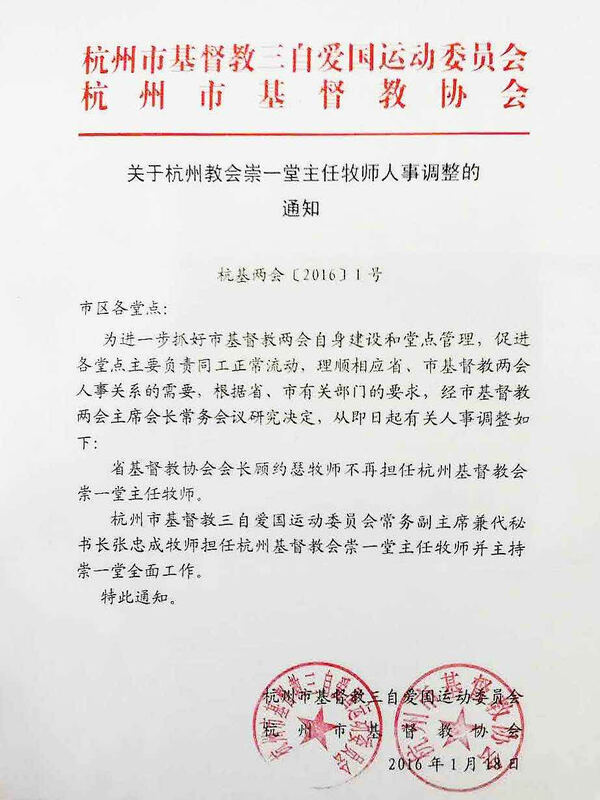 The notice also stated the authorities’ intent to instate Zhang Zhongcheng, the vice-president and temporary secretary-general of the TSPM, as Chongyi Church’s new senior pastor. 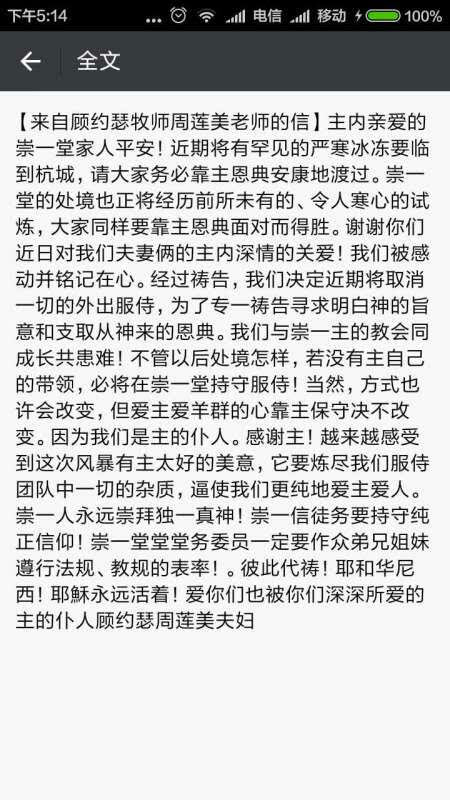 The notice can be read in full below, along with a personal statement from Gu and his wife, Zhou Lianmei, who teaches Bible-based classes at Chongyi Church. China Aid exposes religious freedom abuses, such as those experienced by Gu Yuese, in order to promote religious freedom and rule of law in China. 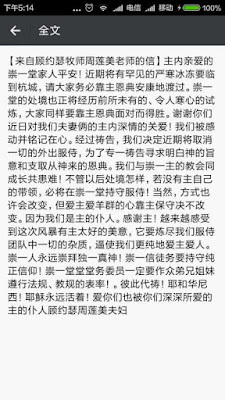 The chairman of the provincial Chinese Christian Council, Gu Yuese, will no longer work as the senior pastor of Chongyi Church in Hangzhou. The vice-chairman and temporary secretary-general of the Hangzhou Chinese Christian Three-Self Patriotic Movement Committee, Pastor Zhang Zhongcheng, will serve as the senior pastor of Chongyi Church and take charge of all the work. Peace to the beloved [Christians] of Chongyi Church! Soon, a rare freezing, cold will befall Hangzhou; please, everyone must rely on the Lord’s grace to be healthy. Chongyi Church is also experiencing unprecedented, chilling trials. Everyone must equally rely on the Lord’s grace to confront [this hardship] and triumph over it. Thank you for the deep, loving concern you have showed to the two of us recently as a married couple! We are so touched and will engrave this on our hearts. Through prayer, we decided to cancel all [events in which we] go out to do ministry in the coming days in order to pray, try to understand God’s decrees and draw from his grace. We will go through thick and thin with Chongyi Church! Regardless of how the situation will be after this, we will inevitably continue serving at Chongyi Church if there is no other guidance from the Lord himself! Of course, the manner [of service] may change, but our love of the Lord and his flock will never change, because we are the Lord's servants! Thank God! Increasingly, we feel God’s good intentions in this storm. It will refine every impurity in our ministry team to the greatest extent and compel us to love the Lord and people more purely. People in Chongyi Church will worship the only true God! 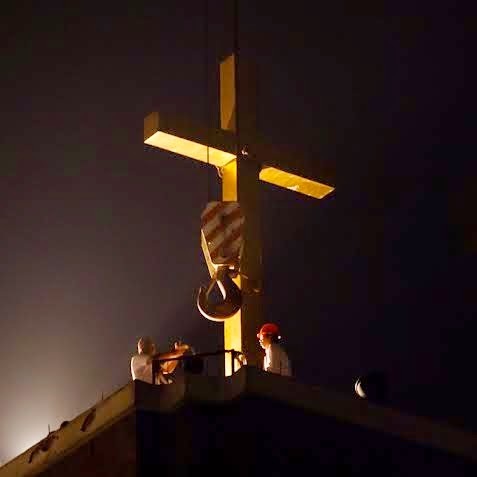 Christians from Chongyi Church must, by all means possible, adhere to a pure faith! Those in charge must [ensure] that the many Christians [at Chongyi Church] comply with the [legal] statutes! Pray for each other! Jehovah Nissi [Editor’s Note: This is a Hebrew expression, meaning, “The Lord is my banner”]! Jesus lives forever!